Farmer’s son Robert Foss brought his building skills from New Hampshire to sunny California, heading a design/build firm that bridged the gap between the commercial interests of the builder and the artistic realm of the architect. 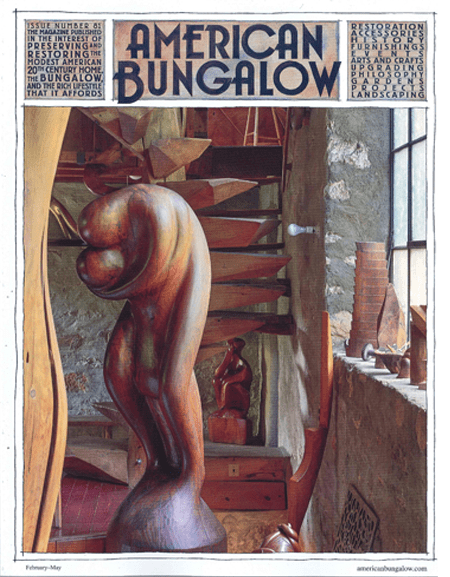 The unique Pennsylvania home and studio of a visionary artist/craftsman, mindfully sculpted from the ground up, is the embodiment of organic architecture and a tribute to a life well lived. The recently re-discovered Lawrence F.
amenities for today’s bungalow lifestyle. Reflections on the Movement and its revival.